The limo speed at extant Z207 could have been 28.63mph, I just don't believe that is the case. 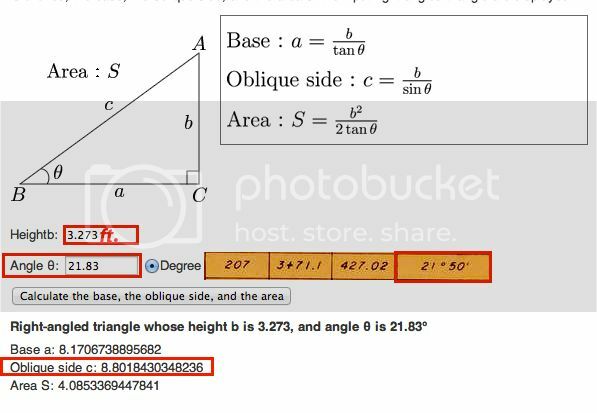 Remember, the formula for Elm St. at 3.13degree street slope = 1ft vertical per 18.3ft horizontal. Post #33 as a follow up, if interested. Now, seriously, with that toy scope, intended for a pellet gun or a .22, do you really think anyone could lead a target by 6.7" at 88 yards? Good luck. In one of the countless YouTube interviews of Gary Mack, he said something that I found interesting in one of them. 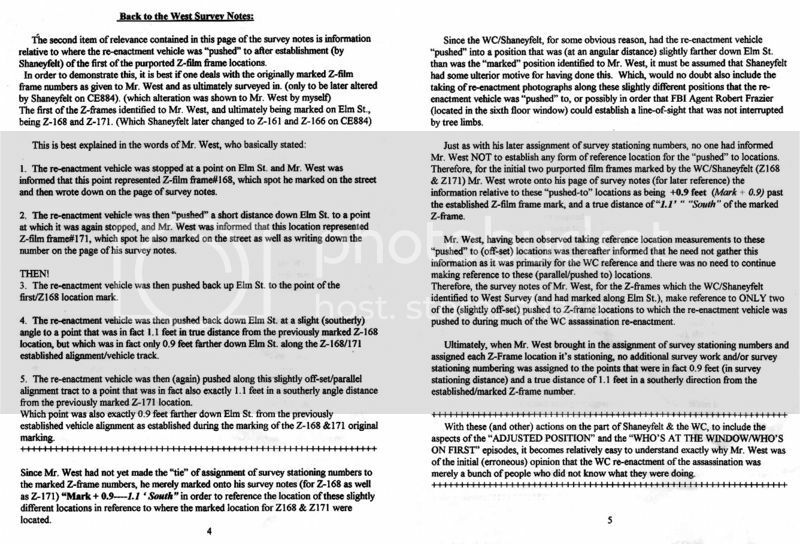 Gary's analysis of the snipers' nest had the shooter standing behind the window sill boxes, rifle barrel resting on the top box & shooter simply pointing the barrel in the general vicinity of body mass (no use of fixed sights or scope for aiming), pulling the trigger 2-3 times & working the bolt rapidly. Gary believed this is how the shooter (Gary believed it was LHO) avoided the gas blowback coating his face. The boxes would also serve as a thick shield if any of JFK's guards were fast enough to return fire. Gary theorized that this is why LHO only changed his shirt & not his trousers; trousers were shielded from blowback by being behind the boxes). The type of shooting Gary described is what Army marksmanship instructors called 'slop shots' when I served. It's also known as 'Annie Oakley' style 'guestimate' without aiming style shooting (similar to the manner in which Chuck Connors demonstrated during the opening sequence of TV's 'The Rifleman'). I commented in another the thread that the sniper's nest shooter should have smelled like he had been firing fireworks had he fired 2-3 rounds off using conventional aiming techniques. 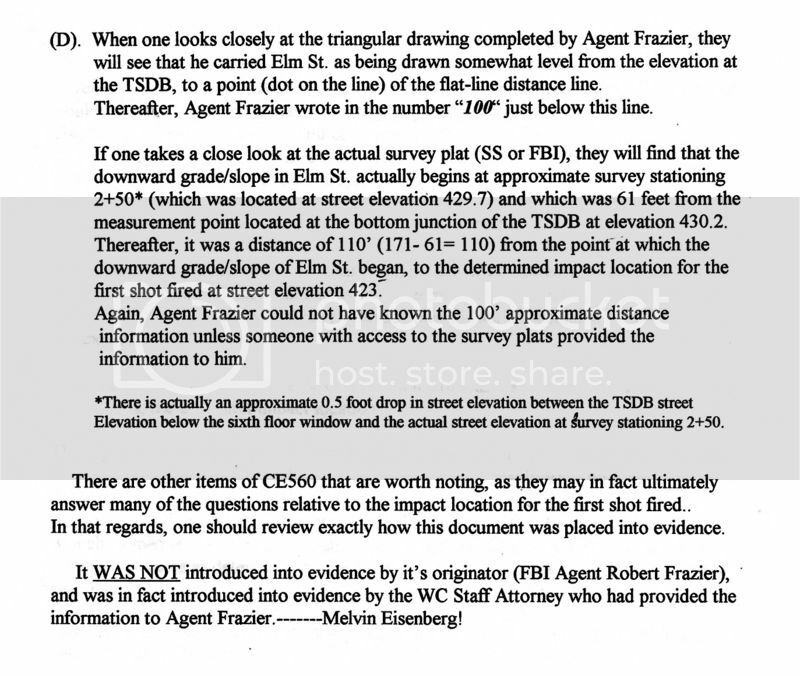 It should have been easily detectable to anyone who came into close contact with that person. For LHO, this would include Officer Baker, Roy Truly, Pierce Allman, bus & taxi drivers (+ passengers), LHO's landlady, Officer Tippit, Texas theatre arresting officers, those who 1st interrogated LHO at DPD headquarters in addition to the DPD hallway TV reporters close enough to LHO to smell him. I don't recall any of those people ever commenting that LHO smelled like he had been popping fireworks (the most common description of how a person smells after firing a weapon). I can remember a grime that built up under our fingernails after my units fired their individual assigned weapons at rifle ranges for annual qualification. The grime resembles how a mechanic's fingernails look after working on cars. It took quite a while to completely get it out from under fingernails. The point is: LHO should have reeked of gunsmoke everywhere he went & whoever came into close contact with him & those persons undoubtedly would have commented on it. Gary's theory obviously would cause problems for a second gunman sharing that window & at least one witnesses stated on record that she saw 2 armed shooters in that particular TSD 6th floor window. I think Gary vastly overestimated the amount of blowback produced by a bolt action rifle, as compared to a revolver. A revolver loses a large amount of gas, simply because there is a small gap between the chamber the cartridge is in and the barrel of the revolver. This cannot be a tight seal, or it would be impossible for the chamber of the revolver to turn and align the next cartridge to be fired. OTOH, a bolt action rifle chamber seals itself as soon as combustion of the gunpowder begins, and rising internal cartridge pressures swell the brass cartridge outwards to seal it against the chamber. There is a gas port on the side of the chamber of a bolt action rifle, but it is there to vent gases in the case of a ruptured primer or casing. Since I don't have surveys for most frames on CE884, the method above can be used if one has access to an online conversion calculator, easier than manually computing the appropriate figures. 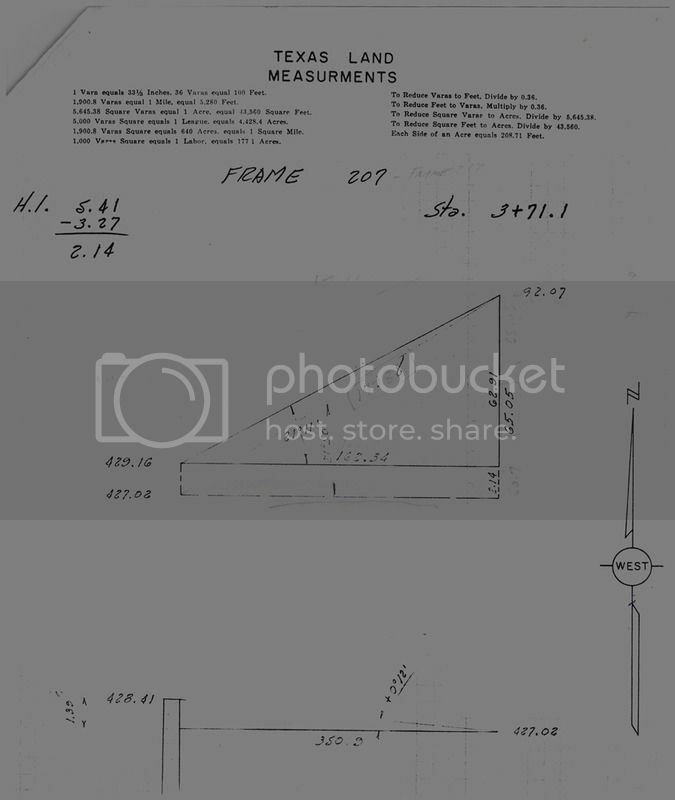 The determined height of 65.68ft dictates the hypotenuse length which equals the "line of sight" distance from rifle to JFK's head 3.27ft above the street. 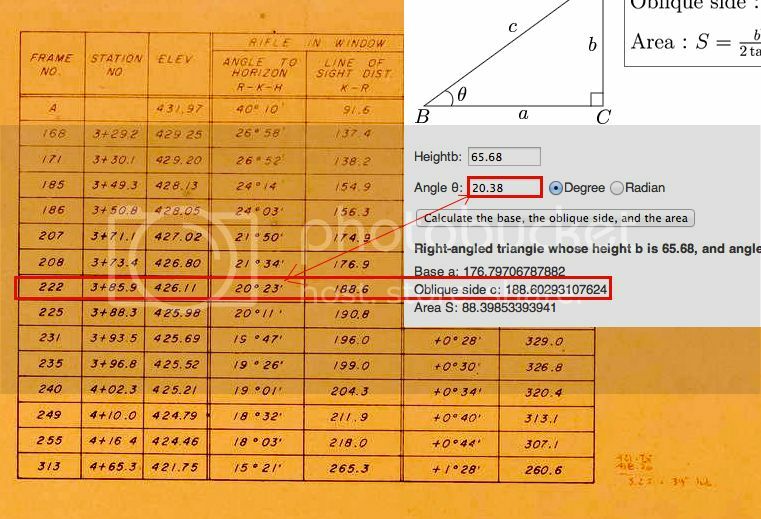 65.68ft + 3.27ft = 68.95ft - 68.06ft = .89ft = height of rifle above the windowsill frame at z222 according to CE884. .89ft = 10.68 inches above the windowsill frame = 26.68 inches above the floor = .68 inches above the sniper's perch box. Compare this to the rifle height above sniper box at z207. Visually speaking. A one degree change plotting from extant z207. 110ft/18.3 = 6.01ft. elev change. 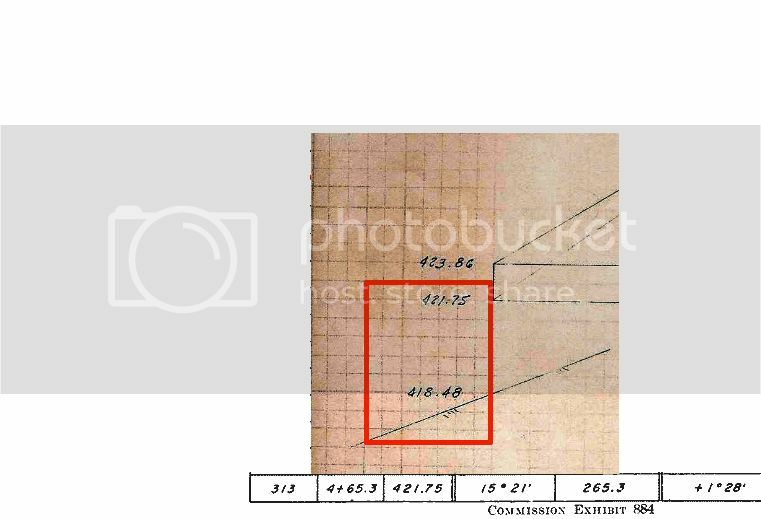 490.9 - 423.07 = 67.83ft -60.7(window frame sill)- .5(curb height)= 6.63ft elev change.